The model change for the biggest displacement air-cooled naked model marketed in Japan Release of the new Yamaha "XJR1300" - News Releases | Yamaha Motor Co., Ltd. 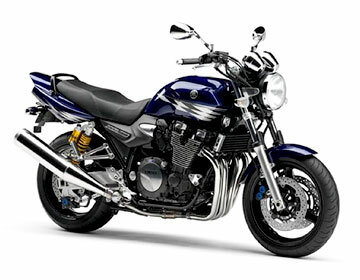 The model change for the biggest displacement air-cooled naked model marketed in Japan Release of the new Yamaha "XJR1300"
On November 30, 2006, Yamaha Motor Co., Ltd. (YMC) will release on the Japanese market a new model change of the Yamaha "XJR1300," the biggest displacement air-cooled naked (no cowling) model marketed in Japan, powered by an air-cooled 4-stroke, DOHC, in-line-4 engine that adopts a fuel injection (FI) system for the first time along with other changes. With the key words "a deeper and wider Sporty models" for this model change, new technologies are adopted in all parts of the machine, from the engine to component changes in the chassis. The main features are optimization of the intake system in order to increase torque primarily in the low- and mid-speed ranges, adoption of a fuel injection system which contributes to great response and environmental friendliness, adoption of a 4-into-2-into-1 type exhaust pipe, adoption of a deluxe-model Ohlins rear suspension (specialized settings), etc. 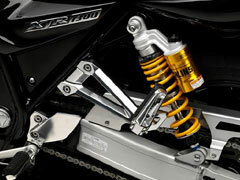 The combined effect of these changes gives the new XJR1300 an even sportier ride in a wide range of the use conditions. A 4-into-2-into-1 exhaust pipe with a fresh new shape has been adopted in order to bring out excellent torque characteristics. Furthermore, it is outfitted with a 3-way catalytic converter (a device that simultaneously oxidizes and breaks down CO, HC and NOx in the exhaust), and in order to help the catalyzer function more effectively, an oxygen sensor is used to detect the level of oxygen remaining in the exhaust and constantly feed back that information to enable appropriate adjustment of fuel supply to achieve both outstanding power output and environment-friendly performance (clears Japan's emissions regulation for 2007). Other changes include (1) new settings for the front suspension, (2) the front and rear radial tires with special specifications, (3) a new-design sheet, (4) new-design side covers, (5) new handlebar position, (6) LED taillights with a fresh look and (7) quality-look internal illumination for the meter panel, etc.